"Sentiment Analysis" crunches 30 tweets per second to show emotions as patterns of light. Even if you see thousands of tweets per day and all the emotions that go with them, that's just a tiny fraction of Twitter's total traffic. A new art project wants to help you grasp the joy or fury expressed by all of the users around the world at once. The Fuse Studio's "Amygdala" installation at the CUBO Centro Unipol in Bologna, Italy crunches up to 30 tweets per second and translates each into one of six emotions: Happiness, anger, sadness, disgust, amazement or fear. The "Sentiment Analysis" is displayed on 41 LED bars in the Media Garden via 125,952 lights, total. It's fed by 2.75 km (2 miles) of fiber-optic cable, and represents total Twitter activity with fountain-like patterns of lights, including bright bursts during busy periods. 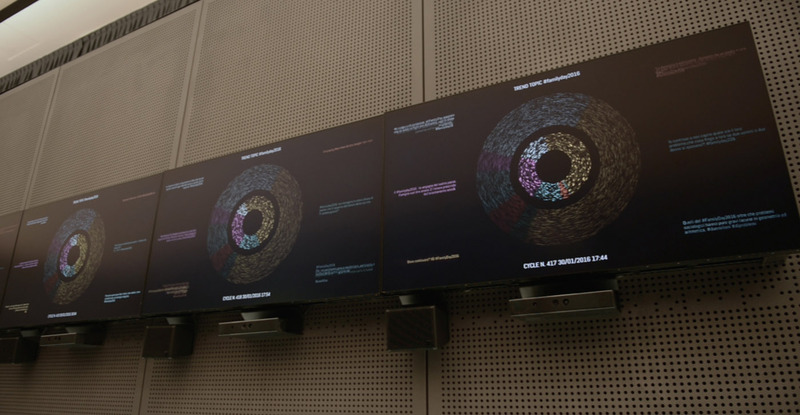 Every 10 minutes, that data is sent to a dozen video walls inside, where the six emotions are displayed as specific color patterns. The idea is to show "the evolution of the global emotional state ... which will go on to form the emotional memory of the three months in which Amygdala will be deployed," according to Fuse.